Inflation in China, the world's fastest-growing major economy, accelerated to its highest level in more than 10 years, fuelling speculation that the Government may raise interest rates for the fourth time this year. 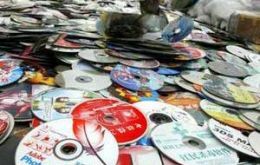 United States asked the World Trade Organization to rule in a complaint against China over piracy of copyrighted movies, music, software and books, escalating a dispute that has soured commercial relations between the two trading giants. 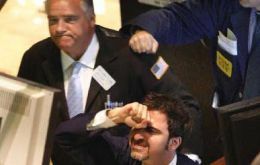 The United States Federal Reserve pumped 38 billion dollars into the banking system Friday, marking its biggest operation since the week of the 9/11 terror attacks, as it vied to shore up the US financial system. The Falkland Islands, considered as part of the South American continent, have the highest percentage of population internet connection, 69%, followed by Chile, 42%, Argentina 34% and Uruguay 33.6% according to the latest release from Internet World Stats. 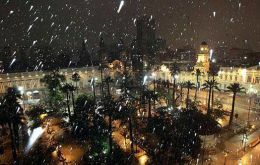 Chile's capital Santiago woke up Thursday to a very unusual sight: most of the city was covered by ten to fifteen centimeters of snow, becoming thicker towards the east and the mighty Andes cordillera. The European Central Bank, ECB, pumped 94.8 billion Euros into the Euro zone banking market Thursday in an attempt to contain fears about a sub-prime credit crunch spilling over from United States. The Chinese government has begun a concerted campaign of economic threats against the United States, hinting that it may liquidate its vast holding of US treasury bonds if Washington imposes trade sanctions to force a Yuan revaluation. World Bank President Robert Zoellick criticized on Thursday corruption in poor countries that receive the bank's loans, echoing the anti-graft stance of his controversial predecessor, Paul Wolfowitz. Fears that the Argentine government appears to be intentionally underreporting inflation in an election year emerged again this week when the scandal plagued Statistics and Census Institute (INDEC), under judicial investigation, announced 0.5% July inflation.